This is “Printing”, section 1.4 from the book Using Microsoft Excel (v. 1.1). For details on it (including licensing), click here. Open the Unit Sales Rank worksheet by left clicking on the worksheet tab. Click the Wide option from the Margins drop-down list. Open the Sales by Month worksheet by left clicking on the worksheet tab. Click the Page Layout tab of the Ribbon (see Figure 1.62 "Page Layout Commands for Printing"). Click the Margins button in the Page Setup group of commands. Click the Narrow option from the Margins drop-down list. Click the Orientation button in the Page Setup group of commands. Click the down arrow to the right of the Width button in the Scale to Fit group of commands. Click the 1 Page option from the drop-down list. Click the down arrow to the right of the Height button in the Scale to Fit group of commands. Click the Insert tab of the Ribbon. Click the Header & Footer button in the Text group of commands. You will see the Design tab added to the Ribbon; this is used for creating the headers and footers for the printed worksheet. Also, this will convert the view of the worksheet from Normal to Page Layout (see Figure 1.63 "Design Tab for Creating Headers and Footers"). Place the mouse pointer over the left section of the Header and left click (see Figure 1.63 "Design Tab for Creating Headers and Footers"). Click the Current Date button in the Header & Footer Elements group of commands in the Design tab of the Ribbon. Click the Page Number button in the Header & Footer Elements group of commands in the Design tab of the Ribbon. Click the Normal view button in the lower right side of the Status Bar (see Figure 1.64 "Worksheet in Page Layout View"). Open the Sales by Month worksheet by left clicking the worksheet tab. Repeat steps 2 through 11 to create the same header and footer for this worksheet. Click the Print option on the left side of the Backstage view (see Figure 1.65 "Print Preview"). On the right side of the Backstage view, you will be able to see a preview of your printed worksheet. Click the Print Active Sheets button in the Print section of the Backstage view (see Figure 1.65 "Print Preview"). Click the Print Entire Workbook option from the drop-down list. This will print all worksheets in a workbook when the Print button is clicked. Click the Next Page arrow at the bottom of the preview window. 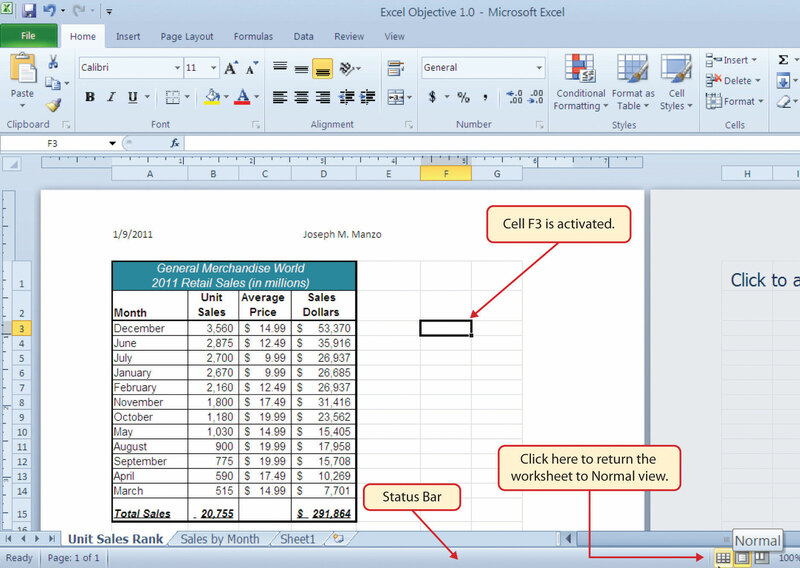 Save and close the Excel Objective 1.0 workbook. Which of the following commands is used to print the column headings in a worksheet at the top of each printed page for a worksheet that contains 100 rows of data? Which of the following is true with respect to printing Excel worksheets? Setting the Width and Height drop-down lists to 1 Page will ensure that all the worksheets in a workbook are printed on one page. The page layout settings must be set for each worksheet in a workbook. 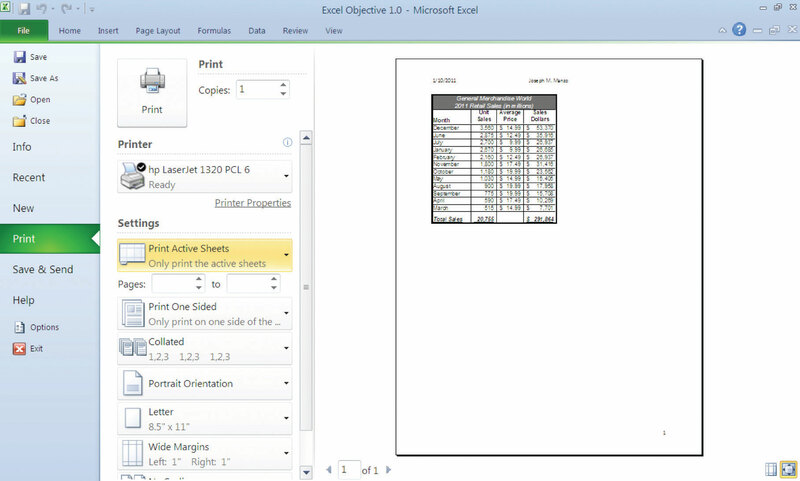 You can print only one worksheet at a time in a workbook that contains multiple worksheets.